Vinyl lovers rejoice! 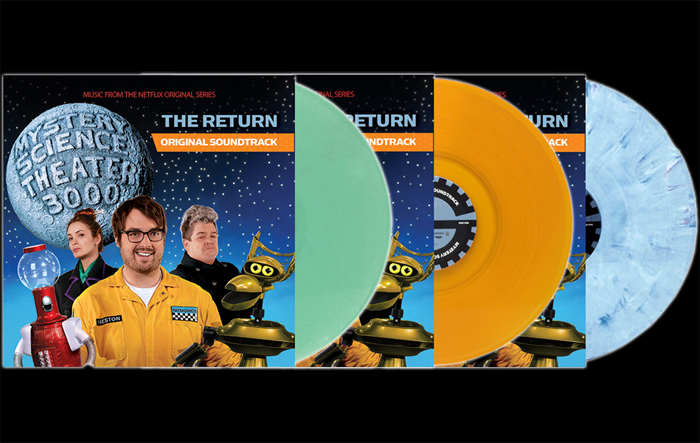 MST3K The Return: Original Soundtrack features several mighty-fine options if you like to collect limited-edition vinyl in fun colors. From the MST3K Store, get the glow-in-the-dark soundtrack vinyl. It's shipping right now and comes with an awesome MST3K moon logo turntable pad! From Real Gone Music, get their exclusive Blue-Grey "Satellite of Love" vinyl, limited to 1,000 copies! Pre-order now for the April 6th street date from the Real Gone website here. From FYE, get the exclusive gold vinyl limited to only 500 copies! You can find it in FYE stores April 6th.